The padded embroideries of Burma are unique. Their combination of legendary figures and animals, sequins, stones and mirrors create hangings unlike any others. Although Burma has been largely inaccessible for almost 50 years families continue to work on producing Kalagas of high quality. 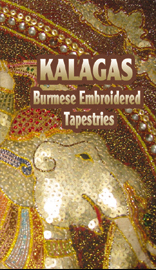 This film shows the process of producing Kalagas in the Mandalay area. Filmed in Mandalay. Contents: The whole process of creating these ornate embroideries including designs, sewing and the making of the sequins, glass stones and metalled thread. Also the making of the costumes for Burmese puppets.